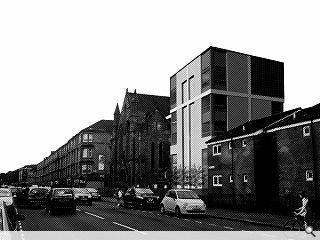 Page\Park have tabled proposals for the conversion and extension of Old Carntyne Church, Shettleston, to form accommodation for the elderly. 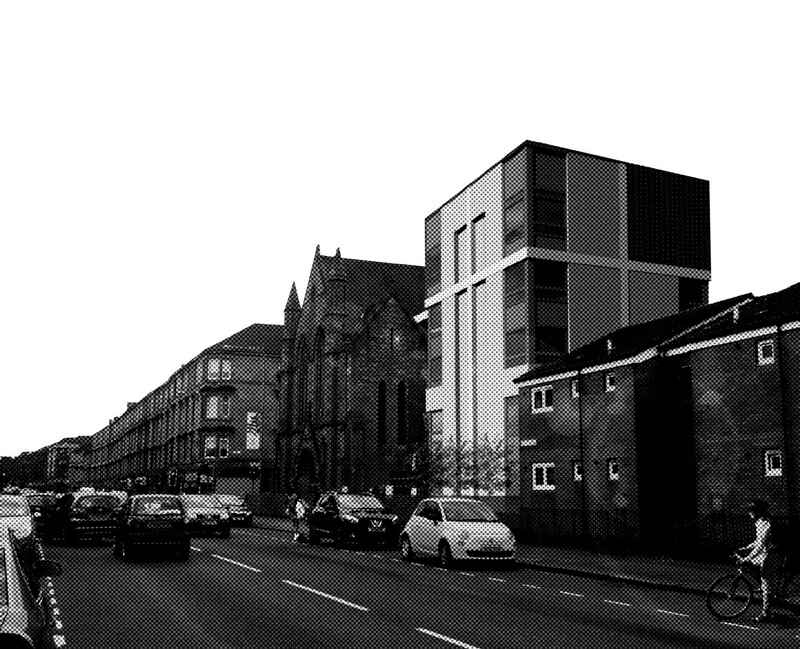 Forming part of an existing sheltered housing complex owned by Shettleston Housing Association the 19 flat scheme will involve creation of a new build element on the site of the former church hall, demolished in 2014. The project will be brought forward as a car-free development after Persimmon Homes rescinded permission to allow access across its land, enabling an inner courtyard to be turned over to amenity space for residents. This will include removal of current parking from a back court area to make way for soft landscaping, drying areas and social space. Chantelle, stop pacing around, sit down, take 3 deep breaths. You have to wonder how this got past first back in the office though. Worst proposal of the year so far?! Halftone pattern, lens flair and converting to black and white....not so much polishing a jobby as kicking some leaves over it and hoping nobody slides in it. Seriously, is it just me, or does this 'treatment' chime with anyone else as echoing the language of Stirling's Clore Gallery? This is the hing am gettin at: when left wing ideology takes root oor society; when we huv contempt fur oor environments; when we associate columns and ornament wae the past an no the future and present, we get this kind of nonsense imposed upon us by oor lefty architecture messiahs. Why is thur an ugly box next to a beautiful church? Wit does it acshully achieve? Noo, tae aw the concrete modernists on here, the kind who are pretendy hipsters and think concrete boxes are "progressive", acshully look at this. Look wae yer eyes. Look. Look at the church. Look at its detail and beauty. And look at wit is being proposed next tae it. Can u honestly say this is good? It isnae. It is disgraceful. It's like covering a beauftul gravestane wae dulux paint and pebbledash and saying its progressive. Hmmm… yes indeed diner tec it is very Clore Gallery - one of Stirling’s best in my opinion though sadly still too unfashionable for some. Personally, I was rather enjoying the playfulness of the whole mid phase POMO Stirling style run through a Venturi Scott Brown filter. The added schadenfreude is knowing that the ‘serious modernists’ who occasionally read Urban Realm will be spitting out their coffee in horror once they see this image. Ah, but i recall seeing the seductive drawings for the Clore Gallery, but then visited it by chance a few years ago and I could equally well have been visiting some embarassing po-mo drek job centre in Bathgate or wherever - never mind the tardy tardy exterior, the interior was completely naff replete with lime green entrance and purple CHS handrails et al. Between the idea and the reality, falls the halftone pattern. It's the artifice of it and the lack of integrity that belies this patronising homogenous image. Ahem… but surely it was Stirling’s genius that launched the thousand imitations that only serve to dilute his impact? I realise it is easy to sneer at it all now but when you place him in context he was doing good work that demonstrates an interest in how modernism could be reformed and enriched by taking cognisance of both the past and its surrounding context in the same way that Pop Art, Picasso et al used collage. That’s also why both Venturi and Scott-Brown are still at pains to represent themselves as being part of the modernist tradition and reject the badge of being the first post-modernists. That remains important however much those who admire the Red Trilogy would like to excuse what followed as an embarrassing mistake in Stirling’s development as an architect that is best quietly forgotten about when it is actually a clear and logical extension to an oeuvre. And, given that he is one of the great architects of the 20th Century and was born in Glasgow, being brought in Kent Road round the corner from the Mitchell, wouldn't it be great if we could celebrate that with the unveiling of a plaque during the Year of Innovation, Architecture and Design? Po-mo was a historic aberation. Stirling , proof that you really only need to do to two good building and then your architectural reputation is sorted. Whoop. New top score of 13! Keep up the wonderfully trite prose Big Chantelle! I used to live just behind that church. That design is nothing but pathetic. Probably another cheap design from a part 2 who had to chuck it out in about half an hour without visiting the site. In the right location this would probably look ok. But it seems out of place here.